War-date Confederate Document Signed “Joseph R. John” 1pp. 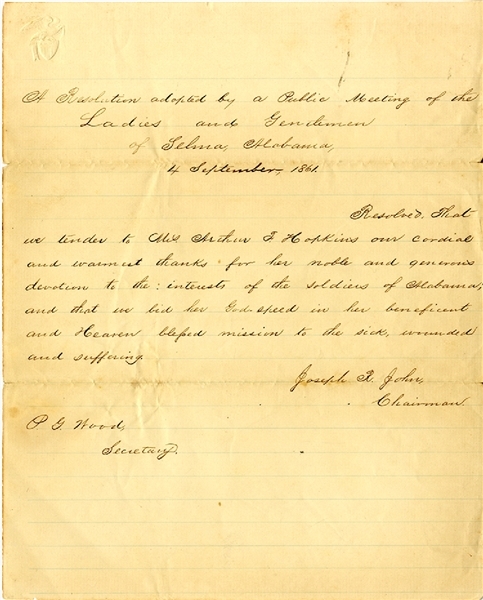 quarto, September 4, 1861, Selma, Alabama, and reads “Resolved, That we tender to Mrs. Arthur F. Hopkins our cordial and warmest thanks for her noble and generous devotion to the interests of the soldiers of Alabama and that we bid her God speed in her beneficent and Heaven blessed mission to the sick, wounded and suffering...” Fine condition. Juliet Ann Hopkins (1818-1890) was born on a plantation in Jefferson County, Virginia (present-day West Virginia). After her marriage to Arthur F. Hopkins of Mobile, Alabama, she relocated to that state. During the Civil War, the couple sold most of their real estate holdings and donated the money to the cause of the Confederate States of America. When her husband was appointed to oversee hospitals during the war, she went to work converting tobacco factories into hospitals. She made daily visits to the wounded, and received a battlefield injury in the course of her duties. Her husband died within months of the close of the war, and she spent the rest of her life in poverty. When she died, she was interred with a full military burial at Arlington National Cemetery, with the Alabama congressional delegation serving as her pallbearers. In 1991, she was inducted into the Alabama Women's Hall of Fame. She is the only female recipient, and one of only 48 total, of the Confederate Medal of Honor as recognized by the Confederate Congress and later presented the medal by the Sons of Confederate Veterans.